You have probably heard all about surveillance cameras, and you might even have a few installed around your home. You may not be as familiar, however, with surveillance camera housing, but this housing can be a very important component of your surveillance system. Since you have probably spent a lot of money putting together the perfect system, you will probably be devastated if something goes wrong with one or all of your security cameras. However, this can happen if you do not take extra steps to protect these cameras from different scenarios. One of the great uses of surveillance camera housing is the ability to turn an inexpensive, indoor-only surveillance camera into the perfect camera for your outdoor surveillance needs. 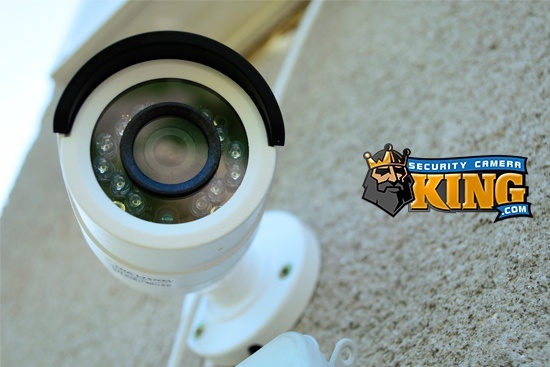 Whether you find a good deal on an indoor surveillance camera or if you simply have an extra one laying around, you can instantly put it to use outdoors if you protect it with the right type of security camera housing. When purchasing surveillance camera housing in order to turn your indoor surveillance camera into one that you can use outdoors, make sure that you purchase the right housing. Inexpensive housing that might work well on a camera that is already designed for outdoor use might not be sufficient for a sensitive camera that is designed for outdoor use, so it is important to look for housing that will protect it properly from rain damage and the other elements of the outdoors. One of the most frustrating and most ironic aspects of home or business security is the fact that thieves sometimes steal surveillance cameras. Not only do they steal these cameras in order to take the spotlight off of them while they are stealing the rest of your stuff, but they can actually benefit from stealing your surveillance cameras in other ways. For instance, many thieves turn around and sell these cameras at pawn shops or online, allowing them to make money off of your valuable investment. Purchasing a vandal-proof surveillance camera housing for your security cameras is a great way to protect them from thieves. Not only does this prevent thieves from taking your surveillance cameras, but it also allows you to keep these burglars under surveillance while they are on your property. Once a thief realizes that he won’t be able to remove your security camera from its casing, he might decide to head to another home or business that hasn’t taken such great security measures. For most outdoor surveillance cameras, surveillance camera housing that is designed to protect cameras against the weather are usually sufficient. These cameras do not specialize in any particular type of protection, but they are usually durable enough to protect your camera through normal rain and storm patterns. If you live in an area with relatively mild weather conditions year-round, weatherproof surveillance camera housing is probably a good choice. When choosing weatherproof housing for your security cameras, make sure you take a look at what you are getting before you make the purchase. Metal housing is typically a good choice because it is very durable, so look for housing that is made of metal instead of plastic or a cheaper material. You probably already know that water is really not a good thing when it comes to electronics. Even the nicest of cameras can be completely ruined by a light rain storm, so it is important to take steps against this damage. Although some cameras claim to be waterproof or weatherproof, you can never be too careful when it comes to protecting your expensive electronics, and it is always a good idea to purchase waterproof housing for your outdoor security cameras and other outdoor equipment. 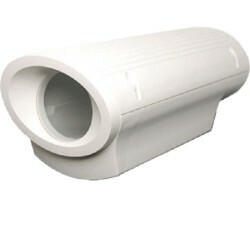 Waterproof enclosures that are designed to serve as surveillance camera housing are generally very sturdy and durable. Not only will they completely seal you security cameras so that they will not be damaged in even the heaviest of rainstorms, but they will also protect your security cameras from other weather-related elements as well. 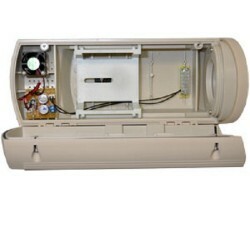 Along with protecting your surveillance cameras with waterproof housing, you should also consider protecting your other security-related equipment with these types of enclosures. For instance, the cords and wires that run from your surveillance cameras and your networking boxes can be severely damaged by heavy rain, but they can be protected by a waterproof enclosure. Even if your area doesn’t often have problems with heavy rain, it is never a bad idea to be too careful, and a good waterproof enclosure will help your surveillance cameras and other security equipment to last for years and years longer. If you have indoor security cameras, you are probably not concerned about the elements that they are exposed to. However, depending on the placement inside the home, you may have to worry about dust getting on your security cameras and causing them to malfunction. Many people place their surveillance cameras up high, even inside the home, and it can be difficult to get to them in order to dust them along with your other possessions. 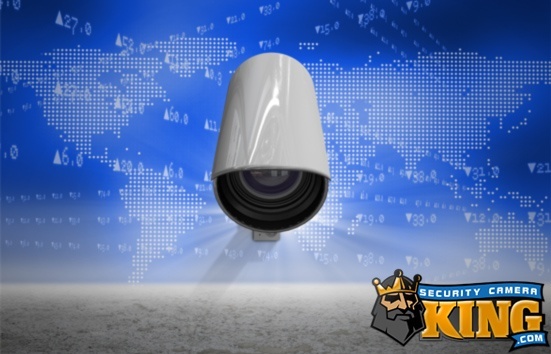 However, dust can get into the components of your security camera and can cause it to short out or to otherwise malfunction, and it will be heartbreaking if something as simple as dust has ruined your expensive surveillance camera. Instead of taking this risk, purchase inexpensive housing for your camera that is properly shaped to cut down on any dust accumulation, and dust your cameras regularly if you are able to reach them easily. The dust protection that can be provided by these surveillance camera enclosures not only works well inside the house, but it can also be utilized outside. Dust and dirt can come from anywhere, and you don’t want to have to climb ladders on a regular basis in order to dust your surveillance cameras. Instead, try placing dust-protection enclosures on all of your security cameras for the best results. This can help to protect your camera from dirt and dust that gets blown around on a windy day or that could otherwise land on your cameras. One thing that you must really worry about when you place security cameras outdoors is the possibility of rust or corrosion. Although you might think that it will take several years for rust or corrosion to affect your security cameras, this can happen much more quickly than you think. This is especially an issue with surveillance cameras that are exposed to rain or the elements on a regular basis. Rust and corrosion can cause major issues very quickly, so you want to do what you can to protect your cameras before this happens. When shopping for surveillance camera housing for your system, look for housing that specifically states that it protects against rust and corrosion. Many weatherproof housing options offer this type of protection. 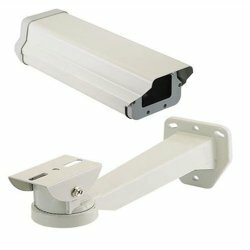 Do You Need Explosion-Proof Security Camera Housing? If your security cameras operate in an area that is subject to an explosion, such as in a factory or other area where flammable or potentially explosive vapors will be exposed to the camera, you will want to consider purchasing explosion-proof security camera housing. This can protect your camera in the event that there is an accident, and you do not have to worry about your surveillance footage being compromised. Although those who live in areas with relatively mild winters might not have to think much about protecting their cameras from freezing conditions, people who live in extremely cold areas or places that have very low temperatures during the winter know that they have to take certain precautions in order to protect their belongings during the cold winter months. Purchasing surveillance camera housing with a heating option is a good idea for anyone who lives in an extremely cold area. Not only do these types of housings typically protect your camera from the water that can occur during rain and ice and from other weather conditions, but they also heat up your camera when necessary in order to make ice and snow melt and to keep your camera well-protected. In areas where there is a lot of snow or ice during the winter or year-round, you can’t beat this type of protection, and you might find that you have a broken or malfunctioning security camera if you do not take these precautions. This type of protection will also help to cut down on condensation on your camera lens, which could fog up the lens and compromise the picture quality of your surveillance footage. Since surveillance camera housing is typically very affordable, it is worth the money to purchase housing for all of your outdoor surveillance cameras. You never know when bad weather or other scenarios might strike, and it pays to be prepared ahead of time. If a bad storm is heading your way, the last thing you want to be worried about is running out and buying protection for your surveillance cameras when you should be worrying about protecting your family and the rest of your home. Instead of waiting for the last minute, go ahead and take steps to protect your surveillance cameras now so that you are prepared when you need it. When choosing surveillance camera housing for your system, remember that the most expensive items are not always the best. Instead, look for housing that provides the type of protection that you think that your security cameras need. Also, make sure to look for housing that is made of strong materials and seems durable itself; you certainly don’t want to find that your cameras themselves seem more durable and stronger than the housing that is made to protect them. 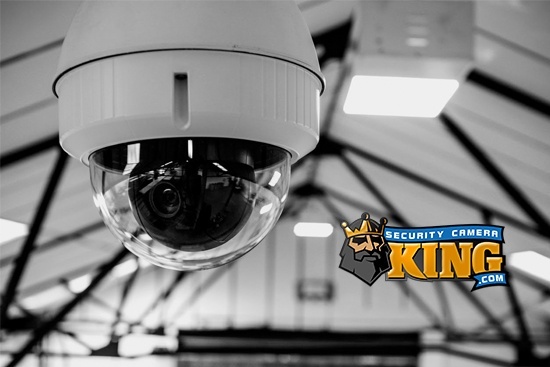 Once you have protected your surveillance cameras, you can rest assured that both your property is under proper surveillance and your cameras are at a much lower risk of malfunctioning.